Based on the lobby of an apartment building I used to live in, the back of Gallery 400 was transformed into an aging hotel lobby. 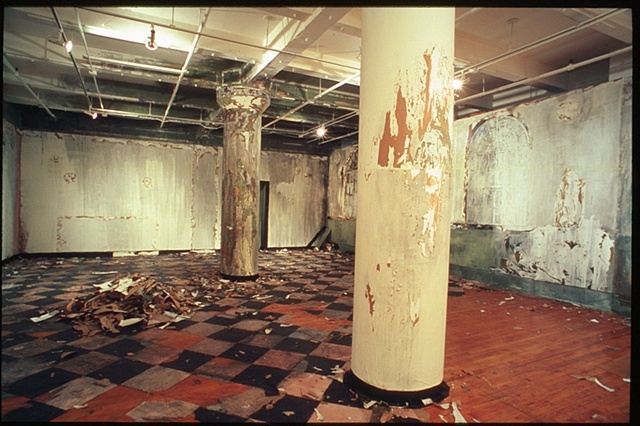 The work was constructed from layers of fabric, painted paper and cardboard that were applied to the walls, floor, and ceiling that were then peeled back. The viewers could enter the space and wander until they were lost in what was in effect a still life painting. Both nostalgic and ironic, the space questioned the erasure of the past in the path of progress and also the validity of the ideas of authenticity.